Recalls of a wide variety of products are often in the news. The amount of information available from media outlets may result in confusion or questions. How serious is the recall? What should you do with the product? What should you do if the product is already consumed? These are just a few of the questions that come up. To clear up some of the confusion or questions let’s explain what a recall is. A recall is a tool used by a company to remove products from sale that may be defective or harmful. Most recalls are voluntary actions taken by a company. When food recalls are announced the appropriate governmental agency reviews that announcement and assigns a classification based on the reason for the recall. Some recalls may have illness outbreaks or injury reports related to them. Others have tested positive for undeclared allergens or pathogens. The recall announcement is reviewed by either the U.S. Food and Drug Administration (FDA) or the U. S. Department of Agriculture (USDA). Consumers can find the recall announcements posted on these agency’s web pages. These websites can be found at FDA or USDA. In an effort to better serve Missouri citizens, the Department of Health and Senior Services (Department) receives these announcements and reviews them to determine how Missouri citizens are affected by the recall. Companies that issue recall notifications that list products that may have been distributed to Missouri or neighboring states are contacted by the Department to determine distribution. Recalls specific to Missouri are posted to the Department’s recall webpage. When recalled product is available at retail food establishments in Missouri, the information on distribution is shared with Local Public Health Agencies (LPHA). With this distribution information food safety inspectors across the state assure that the recalled products have been removed from sale. 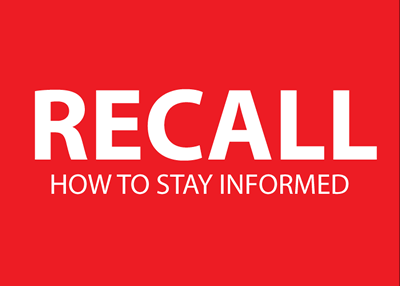 The links below provide additional information on the response activities that occur related to recalled products distributed in Missouri. Several agencies at the federal level post recall notices on products from baby cribs to automobiles. The website that lists recalls these different agencies can be found at Recalls.gov. This page includes announcements from FDA and the USDA web sites.